Take a popup that closes automatically, either by losing focus, by other elements being brought into focus or clicked, or upon expiration of a set display time. Is providing a redundant close button on this popup necessary? Compare the two examples shown side by side in the mockup below. In the first example, the popup appears when the combo box header is clicked and disappears when the combo box is clicked again or any other element on the page except for the popup is clicked. 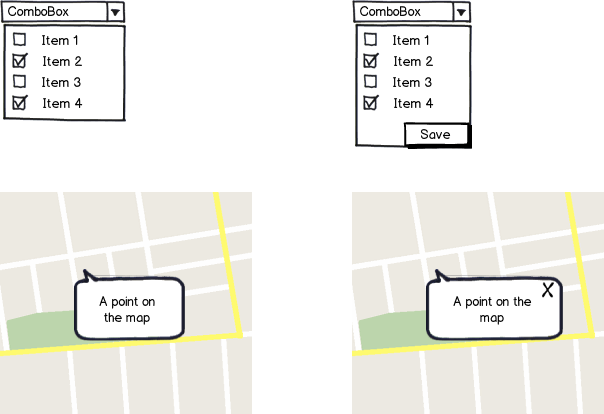 In the second example, the popup appears when a point on the map is clicked and disappears when another point on the map is clicked. I can also provide an example where a right click opens a context menu containing the close button. But I prefer not to place a close button in a context menu. If there is also a different UX standard about this I would like to know about it. A combo box has a specific interaction which has not changed for decades. Its interaction is aligned with a simple user goal - to select one or more items. Most users will expect this interaction. Note: A combo box does not have a pop-up - it is an expandable/collapsible list. A tooltip has a completely different user goal - it is to provide additional information to a user, and it is normally displayed when someone moves the mouse cursor over an object, and disappears when you move the mouse cursor away from the object. Most users will expect this interaction. So you should not expect the combo box and the tool tip to have the same interaction, and to compare them is wrong. However, what you are describing is a pop-up styled to look like a tooltip which is being triggered in some way (click or tap) to persist on the page, so you should display something explicit which allows the user to close it. Now, there is nothing wrong in closing your pop-up by clicking/tapping elsewhere in the page, but this is a hidden interaction which needs to be learned, but it does not hurt to also include an explicit close icon, so that it is abundantly clear how someone closes it. Redundancy (multiple ways to achieve the same thing) can be a good thing. A tooltip without a close button lacks affordance on how to close it. Therefore, users would want to close the tooltip but may not know exactly how. It's not evident that clicking anywhere else on the page will close it. This can cause confusion and even some novice users might leave the current website/app because they might change or mess something. That is why there should always be a visible close option for the tooltip. However, this does not concern tooltips that are closing when they lose focus. To add to the answers already given, let me say that if the two ComboBox mockups you show are intended to be equivalent, at least one of them is confusing/misleading. Having a "Save" button implies that changes will not be saved unless you click it. If the changes are saved automatically even if you click away or close the window, without clicking "Save," you shouldn't have a "Save" button at all as it is misleading. The mockup without the "Save" button implies that changes are saved automatically. Assuming changes are saved automatically, I would recommend no "Save" button on the ComboBox mockup. Neither would I recommend a "Close" button as it could similarly be confused with "Canceling" the changes made. A "Hide" button could be appropriate as it doesn't imply anything about saving or canceling changes. For the "point on the map" popup, the small X button is a good idea for reasons discussed in the other answers. Not the answer you're looking for? Browse other questions tagged buttons popup contextual-menu or ask your own question. Does a tooltip require close button? How important is **Close** button in an expanded view? Is it acceptable to open a modal popup on top of another modal popup? Should login information be remembered after a popup is closed? Close menu after action was picked?